For the first time since rumours surrounding Google’s possible return to China started surfacing this summer, the company’s CEO Sundar Pichai publicly addressed such plans. Speaking at Wired’s25th-anniversary summit, Pichai described the Chinese market as “important for us to explore” and shared insights on how well “Project Dragonfly” is performing in tests while complying with China’s strict censorship rules. Google had left the Chinese search market eight years ago, citing repeated cyberattacks, the surveillance of human rights activists and censorship as reasons for the drastic measure. The company’s plans to (possibly) return to China became public in August, when The Intercept broke the news citing internal documents laying out the plans for a censored search engine for the Chinese market. Google’s possible return to China shouldn’t come as a huge surprise because, questions about censorship and human rights notwithstanding, it is a giant market that hardly any global player looking for growth can afford to ignore. Getting back into the Chinese market won’t be easy for the world’s largest search engine provider though. Chinese internet users live in what might be described as a parallel online universe, using Chinese services such as WeChat, Alibaba and, in terms of search, Baidu where the rest of the world uses Facebook, Amazon and Google. 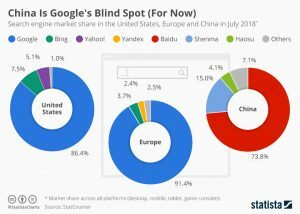 The following chart, based on StatCounter data, shows how differently the Chinese search market looks from its counterparts in the United States and Europe.